The Maya were an early Mesoamerican civilization first established during 2000 BCE - 250 AD (Preclassic period). Mayan cities reached their highest developmental peak during 250 AD - 900 AD (Classic period), and continued throughout the Postclassic until the spanish conquests which occured in the late 16th Century. Often considered one of the greatest civilizations in North America, this remarkable culture is well recognized for its impact on Central American culture in general; and with their advanced developement in art, writing, architecture, agriculture, astronomy, astrology, and mathematics, one can understand why. This culture is noted for having the only known fully developed written language of pre-Columbian America, along with spectacular artwork and monumental architecture; The Maya had built magnificent cities, pyramid structures and sacred stone temples. The intricate monuments found within their cities were used for ritual and ceremonial purposes. Most astounding is the Maya sophisticated mathematical systems and extremely accurate astronomical observations. The maya's knowledge and use of science and mathematics helped them to produce extremely accurate astronomical calculations based on naked-eye observations of the heavens; they were able to predict celestial events such as eclipses and solstices. Their charting of the celestial bodies are superior, or at least equal, to those of any other early civilization that also charted these movements without a telescope. Their primative use of numbers is actually quite complex and astonishingly accurate when compared to our modern day understanding of concepts such as "time". Numbers played an important role in Mayan society and were essential to the workings of the Mayan Calendrical system. The Maya are noted for their development and use of the concept of zero in mathematics, and they also worked with larger sums of number that reached will into the hundreds of millions. Among the many types of calendars, the most important included a 260-day cycle, a 365-day cycle which approximated the solar year, a cycle which recorded lunation periods of the Moon, and also cycle which tracked the synodic period of Venus. The Long Count Calendar was used in most of Mesoamerica and was used to track longer cycles of time. The Maya invented a system of writing that used pictographs to represent sounds. 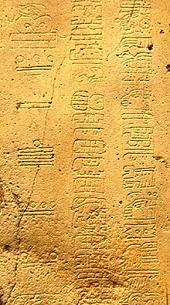 In order to record their observations of the world around them, and that of the society, the Maya kept a record-keeping system that was dependant upon this symbolic/hieroglyphic written language. The Long Count calendar was used for tracking and recording celestial observations and historical events throughout time. The elaborate and symbolic writing was either painted or carved onto artwork such as pottery, statues, and also on monuments such as the pyramids and temples. Books were also created by using folded fig tree bark with folded leaves attached to create pages. In the early 16th century AD the Spanish conquistadores arrived. The conquest mainly took place in the northern and central Yucatán Peninsula and also various regions of the Guatemalan highlands but would eventually spread out for the purpose of colonization and to obtain political rule over much of the western hemisphere. This Spanish conquest of Yucatán was a far more difficult and lengthier of a process than the similar conquests of the Aztec and Inca Empires. Concerning the Maya regions, the spanish were initially motivated by rumors of there being precious metals such as gold and silver; however, most of the Maya lands were actually very poor in such resources. The Conquistadores turned there attention instead to central Mexico and Peru which were rich in these resources. Nevertheless, the conquests continued in the Mayan Yucatán/Guatemalan regions with the spanish attempting to force the Maya to convert to Christianity and to pledge loyalty to the King of Spain. Eventually the Spanish invaders destroyed most of the Mayas' library of books, burning that which they claimed to be the "work of the devil" and thus, erasing most of the recorded mayan history. Three of the books that managed to survive are known as "Codices" and they still remain today; a possible fragment of a fourth codex also exists. The four codices that exist today are known as: The Madrid Codex, The Dresden Codex,The Paris Codex, and The Grolier Codex. What is known today about the Mayan calendars has been pieced together through extensive research; this work has been carried out by Mayan scholars based on archaeological remains, evidence obtained through the sacred Codex books, and of course, by that which has been provided by the remaining Maya culture that still thrives today in South America. The Maya were never truly defeated. The Maya are well known for their extremely accurate and complex calendar systems and almanacs that date back to around 600 BCE (before common era). Early Mesoamerican calendars did not originate with the Maya, but their civilization fully developed and refined them into a more sophisticated system; the Mayan Calendar is the best documented and the most completely understood. These calendrical systems were also adopted by the other Mesoamerican nations such as the Aztecs and the Toltec. There were three important calendars that were used by the Maya and the many other mesoamerican civilizations. These calendars are referred to today as the Tzolk'in, the Haab' and the much talked about Long Count Calendar that is connected to the year 2012. The Tzolk'in (also called Cholq'ij) is a ceremonial calendar based on a 260-day cycle. This 260-day cycle consists of a sequence of the number 1 - 13 along with 20 named days. Within this system the 1-13 sequence is repeated twenty times, and simultaneously the 20 named-day cycle is repeated thirteen times, all-together equaling 260 unique individual days. Each number along with it's named day can occur only once within the entire 260-day cycle. After every unique combination of number-plus-day was cycled through ("13 ahaw" being the 260th day), the Haab' count was completed, reset, and would start over again at number one, day one, ("1 Imix"). Here is the complete list of the Tzolk'in day names. The Tzolk'in calendar played a major role in Maya society because it would determine when important events would/should take place, such as community rituals, religious observances, sacred ceremonies, celebrations, and other major events. The Tzolk'in calendar was also commonly used for fortune telling and divination. Each of the named days in the Tzolk'in count had its own omens and associations. An individual's personal character traits and even their destiny could be determined depending on the day of birth. The concept is very similar to that of astrology; the maya were excellent astrologers themselves. The Tzolk'in is still used today within several Maya communities in Guatemalan highlands. It's use is quickly spreading throughout the surrounding area, despite opposition from Evangelical Christian converts who have erased its use from many of the communities. The significance of this 260-day cycle is not completely understood. This 260-day period does not seem to relate to any solar or lunar cycle; it's origin and purpose is still quite a mystery. The numbers 13 and 20 were considered sacred to the Maya, and 13 multiplied by 20 equals 260. The Tzolk'in may also have been created to correspond with the cycles of the planet Venus or with the human Gestation period which is around 260 days. It may have also been used for agricultural purposes, corresponding with the planting and harvesting cycles. The Haab' is a civil calendar based on a 365-day cycle which approximates the solar year. The Haab' count consists of 18 named "months" of 20 days each, plus a period of five nameless "nameless days" at the end of the Haab' cycle. This 365-day Haab'' cycle is also referred to as a "Vague Year" because the actual length of one solar year is 1/4 of a day longer (365.25 days) in duration. This is due to the gradual shifting of the earth over time known as the precession of the equinoxes. The Maya knew that the Haab' was shorter than the actual tropical year, but they did not feel the need to change their calendar to reflect this the way we do today, i.e. the leap year. The five intercalated "nameless days" that were added to the end of the Haab' cycle. This 5-day period was called Wayeb or (Uayeb) , and is often referred to as "no time". The Maya dreaded the Wayeb and considered it to be extremely unlucky and even dangerous. When considering these five days of "no time" the Haab' cycle actually becomes a 360-day count. The last day of each month made use of the Maya's concept of zero; instead of being numbered 20, it was represented by a "sign" that indicated the day of "seating" of the month to follow. The day of seating was also associated with a deity whose influence would be felt for the entire 20-day period. The 20th day of each Haab'' month can actually be considered "day 0", followed by days 1-19, with the last day being the day 0 of the next month, and so on. This is because the Maya felt that the influence of any particular span of time is felt before it actually begins, and is also felt for a short while after it's completion. The Haab' calendar is somewhat similar to the gregorian calendar used today, i.e., there are monthly cycles within the yearly cycle. Similar to the Tzolkin calendar, each Haab' day has its own hieroglyph and number to represent it. The Haab' calendar was used for economic and accounting activities in the society, and also for as agricultural purposes. The 260 and 360 day cycles was good for day-to-day use, but not useful for tracking longer periods of time beyond the solar year. The Haab' Calendar and the Tzolk'in Calendar were used together and synchronized in order to create the Calendar Round cycle. When a particular Haab'' day was combined with a particular Tzolk'in day, a unique "calendar round" date could be obtained. It would take 52 years before the two cycles (the Haab' and Tzolk'in) would again meet to create any individual combination or "calendar round date". Each day in the 260-day Tzolk'in count also had a position in the 360-day Haab'' count. When used together like this each unique day, such as "1 K'an 5 Wayeb" for example, could not return until the next calendar round cycle; this is the equivalent to 8,980 days. Since the calendars were based on the synchronization of the Haab' and the Tzolk'in, the entire combined cycles of both would repeat every 52 Haab' cycles exactly. The calendar round date was satisfactory enough to be considered the "official date" in Maya society considering that 52 years was actually above the general life expectancy of an individual at that time. But of course the Maya understood the cyclical nature of time has existed long before birth and would continue to exist long after death. An accurate and sophisticated way to calculate time in a more linear fashion was needed in order to record historical events and important cycles of time. This brings us to yet another calendar that was used to calculate time periods that exceeded the 52-year calendar round cycle. This is the much talked about "Long Count" calendar that provides a synchronistic connection to the year 2012. The Long Count calendar was especially important in Mesoamerican culture. It was used for tracking longer durations of time that exceeded the 52 -year Haab' cycle. In this calendar, each individual day is identified by counting the number of days that have elapsed since the end of the last Maya Great Cycle; The entire Long count calendar is made up of smaller cycles that occur within even larger cycles of elapsed time; the higher cycles could record time periods that span thousands of years in duration. Full knowledge of this complex calendar system was known only to the ruling Maya elite and was guarded as a sacred source of great power. The Maya inscribed long count dates - actually the picture-glyphs that represented the numbers - on their many artifacts and monuments. The long count was displayed vertically from top to bottom; the count would start with the Baktun at the top and then descend down in order with each numerical coefficient following a base-20 pattern with the exception of the Winal which cycles to 18. The Maya name for a day is K'in (one day of the sun). (13 Baktun, 0 Katun, 0 Tun, 0 Uinal, 0 Kin). Each Long Count date also has it's corresponding Calendar round date. The calendar round date for August 11th 3114 BC is: 4 Ajaw 8 Kumk'u. The Maya thought of time as being cyclical in nature, in other words, time is considered to be a circle which consists of reoccurring cycles or "ages". The ending of a Great Cycle cycle (i.e., the ending of one age and the start of a new one) had much significance for the Maya. The Long Count can be considered a more "linear" look at time since it counts the number of days that have passed since a fixed starting point; similar to the way our current Gregorian calendar does. Thirteen Baktuns would complete one "Great Cycle" which is equivalent to 5,200 Tuns (or about 400 tropical years); the 13 Baktuns of the Long Count span a period of about 1,872,000 days. Many Mayan rituals were concerned with the completion and re-occurrences of the various cycles. The calculations on this page use the Correlation Constant 584283 to convert Maya Long Count dates to Gregorian date and vice versa. You can convert any Long Count or Gregorian date using any of the correlation constants by using this Date Conversion Calculator. The Long Count calendar was designed to always work the same way while still being accurate; even millions of years into the future or backwards into the past. The Maya understood and approached time in a unique way, and their calendars reflected this understanding. Before understanding the calendar system, its best to understand the way the Maya used numbers. Since no calculators or computers were available in ancient mesoamerica, a system of bars and dots were used for counting. A dot represented a value of one, a bar represented a value of five, and Zero was represented by a shell shaped glyph symbol. The Numbers were written vertically from bottom to top and each number position represented a value of 20. Advanced mathematical calculations reaching into the millions and beyond could be calculated by using this system. The Long Count Calendar uses a base-20 (vigesimal) numeral system rather than the base-10 decimal system that is mostly used today in the West. In the maya system, for example: 0.0.0.1.5 is equal to 25 and 0.0.0.2.0 is equal to 40. When performing basic mathematics the Maya would use a pure base-20 numbering, but when it came to the cycles of time within a calendar system a modified base-20 system was used. One Tun can be considered a "year" of 360 days; this is the Haab year of 18 months of 20-day each but without the addition of the 5-day wayeb. example: 0.0.1.0.0 - the "1" represents 360 days. Long Count dates found on architectural structures and on several mesoamerican artifacts, were often represented by heiroglyphic images known (pictographs) and arranged vertically; the calendrical cycles along with corresponding celestial events are documented in the Maya Codices. The Baktun is the first digit in the long-count sequence. The Katun is the second digit. The Tun is the third digit. The Uinal (or the Winal) refers to the fourth digit. The Kin is the fifth (last) digit in the sequence. 1 Kin = 1 day. The rest of the calendar is dependant upon this day-count. In the Long Count, every unit of a given position represents twenty times the unit of the position preceeding it, with the exception of the Winal, which represents multiples of 18×20 instead (i.e. 1 Tun = 18 Uinals/360 days). Since the Long Coung calendar follows a modified base-20 scheme; each number position cycles from 0-19. This base-20 pattern is consistant with one exception: the winal unit resets after only counting to 18 (0-17). The base-20 pattern is use consistently only if the Tun is being considered as the primary unit of measurement instead of the Kin; the k'in and winal units represent the number of days in the tun. The Long Count 0.0.1.0.0 represents 360 days, and not 400 as it would in a pure-base 20 count. The individual day count (the Kin) is always the first to cycle up until 19 is reached and then it starts its cycle again beginning with 0; after this day, the number immediately to the left will increase in value until it also reaches the end of its cycle, and so on into the higher cycles. Still following the example above, the next day would be 12.19.16.0.0 - 7 Ajaw 3 Muwan. The Kin day has reset to zero so now the 17 (which has also completed its cycle) will reset to zero. The Winal does not turn to 18 because it cycles from 0-17 and not 0-19. The 15 has also changed to 16 because the position to its right has turned to zero. In other words, once a number reaches the end of it's cycle it begins again at zero, but only if and after the number to it's immediate right has cycled to zero. The Maya had even larger base-20 units, for example, piktun, kalabtun, k'inchiltun, and alautun. These higher order cycles would create digits well into the millions and beyond, but these were rarely used. Now let's consider the long count date 12.19.19.17.18. On the next day, the Kin position (shown in red) will cycle to zero; this will also bring the 17 to its completion as well and so it will also cycle to zero; and as we can see, so will the Tun position, the Katun, and the Baktun. This day in the gregorian calendar is December 21, 2012. Remember, the Long Count system is a consecutive count of days since the ending of the last great cycle and the start of the current cycle of 13 Baktuns. So on December 21, 2012 a total of 1,872,000 has elapsed since the beginnng of the cycle that began; this beginning date was August 11th, 3114 BC - 13.0.0.0.0. Thus, the 13-Baktun Great Cycle of the long count has come to a completion and the next Great Maya Cycle will begin. The ancient Maya (and the many maya that still exist today) would consider this to be a time of great change, the beginning of a new cycle or era of time. It can be thought of as the ending of a past cycle and the beginning of a new one. "Perhaps the greatest gift the Mayan culture has given our world is the Zero Point to the Precessional Cycle of 26,000 years. What Time Is It Anyway? The Maya believed that time was cyclical in nature. The Long Count calendar can be considered a giant Great Cycle of time that contains smaller cycles of time that can be measured relative to one another. Modern calendars are based on a somewhat linear concept of time (time is considered to be constantly moving forward in a straight line leading into infinity), but the Maya thought of time as a "circle" where cycles repeated themelves over and over again infinitely, instead of strictly traveling out into an infinite straight line never to repeat again. Other ancient cultures such as Incan, Mayan, Hopi, and other Native American Tribes, plus the Babylonian, Ancient Greek, Hindu, Buddhist, Jainist, and others have the "wheel of time" concept that regards time as cyclical and consisting of repeating ages. Each day in the Mayan calendar had a specific meaning and was associated with their religious beliefs; the same can be said for the larger cycles of time that would take years to pass. 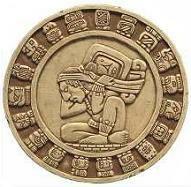 Many rituals and ceremonies, as well as other major aspects of Mayan society were based upon the calendical cycles. You are probably familiar of some of the cycles that exist, such as, the human gestation cycle, the seasonal/weather cycles, the birth/death cycles, and so on. So, the Maya did indeed understand the concept of linear-time (past-present-future). This is one of the main purposes of the Long Count calendar; it counts linear-cycles of time within the greater cycles, and is based upon the amount of days that have elapsed since a fixed starting point. By using the Long Count calendar cultural and historical events could be recorded in a linear relationship to one another; celestial events such as eclipses could be pre-determined, and dates could be recorded over extremely long periods of time. By using the Long Count a day that occurred hundreds of thousands of years in the past or ahead in the future could be determined at any given time. When considering the cyclical nature of time, the influence of individual cycles would have a particular association, influence, or impact on the universe and all that is contained within it at that time. The major cycles within the Long Count could determine when major events in the past had occured and also when those events or influences would occur again in the future. The Maya believed that in order to understand the past, one would need to understand the cyclical influences that create the present. In turn, by knowing and understand present influences one could see the cyclical influences that were to come in the future. Linear-patterns can be identified within these cycles of time with the Baktun, the Katun, the Tun, the Winal, and the Kin. The Kin, or one day of the sun, is the day-count which is the basis for counting the entire span of days with the long count date. The Long Count calendar enabled one to identify a unique date that occurred within the "Great Cycle" of time. The Maya considered one "Great Cycle" to consist of "thirteen Baktuns" which would be a linear count of 1,872,000 days (close to 5,200 years or approximately 400 Tuns). One Great Cycle" is equivilant to 13 Baktuns., and one baktun is equivilent to 144,000 days. 144,000 multiplied by 13 = 1,872,000 days. So this 1,872,000 day period (13 Baktuns) was considered an "era" or "age" of time; but it was more commonly called a "Great Cycle" of time. The Maya are often credited as being the first people to establish chronological record of dates that begin with a "fixed day" in the past; this fixed day would be the starting point of the calendar and each day was numbered accordingly as time progressed. This starting point marks the beginning of recorded time and also indicated the date when they believed the world had came to an end and was recreated. This starting point (August 11, 3114 BC) marks the beginning of a new Great Cycle and is often referred to as the "Mayan Epoch" or day "zero". The ending of one cycle and the beginning of the next would mark a period of extraordinary celebration for the Maya because it would signify a tremendous period of change, or a transition/transformation period of the planet, (perhaps within the universe), and in the collective consiouness itself. The complete significance of this date is unknown but the Maya may have thought of this starting point as a marker of the beginning of the mayan creation era, or of the beginning of a Great cycle of / in time. This date is also believed to be the beginning of what the Mayans called the "fifth creation". The maya may have targeted this future date of 2012 to fall wthin the 13 baktun era In December of that year will occur a unique conjunction of the winter solistice sun with the crossing point of the galactic equator and the ecliptic. The Maya considered the cyclical nature of time to be reflected in the natural laws of the universe; they believed that these cycles would repeat themselves infinitately through time, and that even civilizations of people would rise and fall in a cyclical progression according to these cyclical laws of nature, thus, they could be predicted ahead of time. It's also interesting to note is that 2012 is a Leap Year in the Gregorian Calendar. In 2012 there will be a unique conjunction of the winter solistice sun with the crossing point of the galactiv equator and the ecliptic. It's debated whether or not the maya may have targeted this future date to fall wthin the 13 baktun era. There is also debate amoung Maya scholars and astronomers about which is the correct correlation constant (gregorian date) that marks the start of the thirteenth baktun (13.0.0.0.0). When converting dates using the correlation constant 584285 we see that the 13th Baktun cycle began on August 13th 3113 BC in the gregorian calendar. This is the most widely accepted date. When using the correlation constant 584285 the beginning of the 13th baktun (13.0.0.0.0) would be August 13, 3114 BC and the cycle would be complete on December 23, 2012. This date is not as widely accepted by Mayan scholars after comparing the archeological evidence that contains insriibed Long Count dates. Other Mayan scholars even use completely different correlation constants from the ones given above. It can all get very confusing. No matter what date is correct there is no doubt that the period between December 20-25th of 2012 marks the ending of a cycle and the beginning of the next. Either way this would be a very extraordinary time considering the syncronistic astronomical events that are also taking place around the same time. The Maya would have recognized this as a new era of time, a "new age" and would signify that a great change would take place; a "shifting" of enery if you will. And it is also no coincidence that according to astrology, (something the Maya were quite devoloped in) we are nearing the peak of the "age of aqurius" around this time. December 21st, 2012 A.D marks a new beginning or time of re-birth. According to the Popol Vuh, a book compiling details of creation accounts known to the Quiché Maya of the colonial-era highlands, we are living in the fifth world. The Popol Vuh describes the first four creations that the gods failed in making and the creation of the successful fifth world where men were placed. The date December 21st, 2012 A.D., represents an extremely close conjunction of the Winter Solstice Sun with the crossing point of the Galactic Equator (Equator of the Milky Way) and the Ecliptic (path of the Sun). The ancient Maya Civilization recognized this as the Sacred Tree. This event has been manifesting very slowly over many thousands of years. It will come to completion at exactly 11:11 am GMT. "The Gregorian calendar was created (as was daylight savings time) as a way to disassociate people with the natural cyclical rhythyms of their body and the Earth. Y2K was a planned scam to divert attention from the truth and to make jaded skeptics of us all. In 2012 one cycle ends and another begins, it does not signify "the end of the world" so much as the beginning of a new cycle of consciousness." A solstice is either of the two events of the year when the sun is at its greatest distance from the equatorial plane. The name is derived from Latin sol (sun) and sistere (to stand still), because at the solstice, the Sun stands still in declination, that is, it reaches a maximum or a minimum. The term solstice can also be used in a wider sense as the date (day) that such a passage happens. The solstices, together with the equinoxes, are related to the seasons. In some languages they are considered to start or separate the seasons; in others they are considered to be center points (in English, in the Northern hemisphere, for example, the period around the June solstice is known as midsummer, and Midsummer's Day is the 24 June — now two or three days after the solstice). The Winter Solstice will occur at 11:11 am Universal Time on December 21, 2012. The 'Message of The Sphinx' with the Sphinx being a type of "clock" telling the "First Time" and the "Last Time." And the "Last Time" will occur that day at 11:11 pm Cairo/Giza time - or 9:11 pm Universal Time. The fact that the Winter Solstice occurs that day at 11:11 am clocks the year 2012 into place. In general, the Judaeo-Christian concept, based on the Bible, is that time is linear, with a beginning, the act of creation by God. The Christian view assumes also an end, the eschaton, expected to happen when Christ returns to earth in the Second Coming to judge the living and the dead. This will be the consummation of the world and time. St Augustine's City of God was the first developed application of this concept to world history. The Christian view is that God is uncreated and eternal so that He and the supernatural world are outside time and exist in eternity. Christian Science defines time as "error" or illusion. Ancient cultures such as Incan, Mayan, Hopi, and other Native American Tribes, plus the Babylonian, Ancient Greek, Hindu, Buddhist, Jainist, and others have a concept of a wheel of time, that regards time as cyclical and quantic consisting of repeating ages that happen to every being of the Universe between birth and extinction.